Al-Ghazali (ca. 1058-1111) - Just when you thought there could be no more candidates for greatest Islamic philosopher, along comes another. However, al-Ghazali walked a different path than the other great ones previously listed on this chart. Tradition holds that he was orphaned as a child when his father died in poverty. 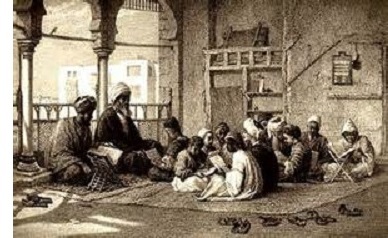 Al-Ghazali and his brother, Ahmad, were raised by a Sufi Muslim. Sufism is considered a branch of Islam which embraces the more mystical aspects of the faith. Although he did not become a full-fledged Sufi (in fact he was Sunni), it did influence his philosophy. He argued on behalf of incorporating several of its doctrines into mainstream Islam. Al-Ghazali was born in the city of Tus in Persia (yet another Persian philosopher). He studied under some of the most prominent teachers in his region; first Ahmad al-Radhakani, and later under al-Juwayni, one of the most respected Muslim scholars of his time. After al-Juwayni died in 1085, al-Ghazali joined the court of Nizam al-Mulk, the vizier to the sultanate of the Seljuk Empire. Although, he left in 1095 to travel throughout the Levant, and then returned to Tus in 1096 to live in seclusion for the next several years. As a result, he played no discernible role in the First Crusade. On philosophy, he single-handedly changed the course of Islamic thinking. The other great Muslim philosophers based their ideas on ancient Greek philosophy. Al-Ghazali rejected this approach. He viewed the likes of Aristotle and Plato as infidels, and regarded their work as heresy. And therefore, by extension, the early Muslim philosophers who based their ideas on the Greeks were wrong. In his book, The Incoherence of the Philosophers, he criticizes those early thinkers, particularly Avicenna and Al-Fārābī. His work became so influential among Muslims that from then on, dismissing non-Islamic thought became the norm. Because of his work, al-Ghazali is often regarded as Mujaddid, a messenger sent every 100 years to revive the Islamic faith.